In celebration of Victoria's proud food history and the State Library of Victoria's Gusto! Exhibition, the City of Melbourne presents a delicious event to showcase the abundant culinary creativity that calls the city home and tantalise the public's epicurean palate. Lord Mayor Robert Doyle and his team has brought together over 30 restaurants, cafes and food retailers to offer Melburnians and visitors a taste of contemporary Melbourne this winter through Look.Stop.Taste. Held from Saturday 18 August to Sunday 16 September 2012, foodies can enjoy the great offers at the full list of participating venues by simply grabbing a map from the venues or downloading it via www.melbourne.vic.gov.au/whatson. Some of the city's favourite and best dining spots participating in Look.Stop.Taste include: Chin Chin, Longrain, Grossi Florentino, Cumulus Inc., Becco, Queen Victoria Market, Lupino, San Telmo, Nama Nama, PM24, Pei Modern, City Wine Shop, Saint Peter's, La Vita Buona, Press Club – Little Press, Maha, Miss Chu, Journal, Phillippa's, Paco's Tacos, Moat, The Windsor Hotel, William Angliss Institute and many more. Lord Mayor Robert Doyle shared that nowhere else in the world can one find such a melting pot of modern, eclectic cuisine as Melbourne. He believes Look.Stop.Taste showcases Melbourne's great culinary culture and encourages people to experience some of the city's most talked about restaurants and eateries. Venture to Longrain and sample a hot and sour prawn salad and roasted rice with a glass of Gewurztraminer for just AUD20, and then walk to Cumulus Inc. for their grilled octopus and a glass of sherry for AUD15. Stroll to Grossi Florentino and score a dish of vitello tonnato with a glass of Chrismont Arneis for AUD25, then stretch your tastebuds with a chicken dumpling and egg drop soup with cabbage, spring onion and white pepper coupled with a Singha beer for AUD15 at Chin Chin. 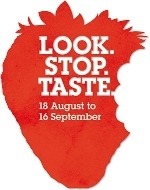 Look.Stop.Taste is an initiative supported by the Melbourne Hospitality and Melbourne Retail Advisory Boards. Further activation programs are planned for September for Melbourne Spring Fashion Week and November for Melbourne Music Week. 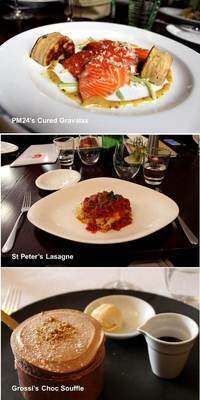 With this month-long celebration of food, Lionel's Melbourne has never been more delicious. I look forward to my own gastronomic adventure and a chat with the various chefs who help make Melbourne one of the best places to dine. Why? Look.Stop.Taste showcases Melbourne’s great culinary culture.